What the crap is green garlic? 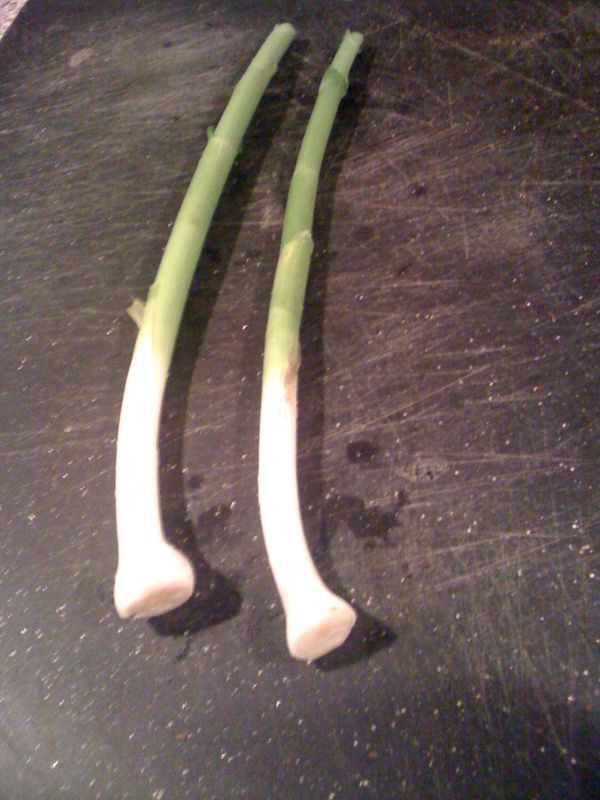 Once you’ve trimmed it, chop it cross-wise into small discs, just as you would a green onion. What the crap do I do with it? Green garlic adds a garlicky-onion flavor to almost any dish. You can use a little less onion in a recipe, and add 2 chopped green garlic stems for every 1/4 onion. Or, you can use it as a substitute for regular garlic. It takes about 2 stems to replace the garlic-ness of one clove; green garlic has a much milder flavor than it’s full-grown counterpart but has a nice crisp acidity and freshness that regular garlic does not. I decided to add my green garlic instead of leeks in a Spring Veggie Risotto. I know what you’re thinking. “ACK! Risotto?? Doesn’t it take a long time? Isn’t it hard?! Don’t I have to stir it forever?? ?” Calm down. This risotto is easy. Yes, you have to stir it a lot. I actually like that, because I cant seem to *not* touch the food that i am cooking. But trust me. Give this one a go, and you’ll never be scared of risotto again. Heat the chicken stock and the water in a medium saucepan on a back burner, until it is a low simmer. You want the stock to be warm when you ladle it into the rice– this is what gives risotto that creamy texture. Heat 2 tbsp of olive oil in a large pot over a medium flame. Add the green garlic, mushrooms, and asparagus, as well as salt and pepper to taste. Sautee the veggies until the asparagus has softened a bit, but still has a crunch, and almost all of the oil has been absorbed– approximately 6 minutes. Remove the veggies from the pan and set aside. In the same pan, heat 1 tbsp of olive oil. Add the onion and cook until translucent and softened, approximately 4 minutes. Add a bit of salt and pepper. Stir the rice into the oil and let toast for approx 2 minutes. With a ladle, pour approximately 1/2 cup into the pot and stir. You want enough liquid so that there is a layer of stock, but the rice is not swimming. Continue to stir the rice until almost all of the liquid is absorbed. Do not wait until the rice is dry, just until most of the liquid is gone. At that point, add an additional ladle of stock and stir. You should stir the mixture regularly to ensure that the rice does not stick to the pan. Repeat this process until all of the stock is gone, and the rice is firm and creamy. Remove the pot from heat. Stir in the cheese and the veggies, and salt and pepper to taste. For best results, serve immediately and with extra cheese for topping. Serves approximately 6 as a side dish and 3 as a main dish. Or, in my case, 2 side dishes and lots of leftovers for the week. They say risotto doesn’t keep well, but add a bit of water before reheating and it stays creamy. Hope you enjoy! 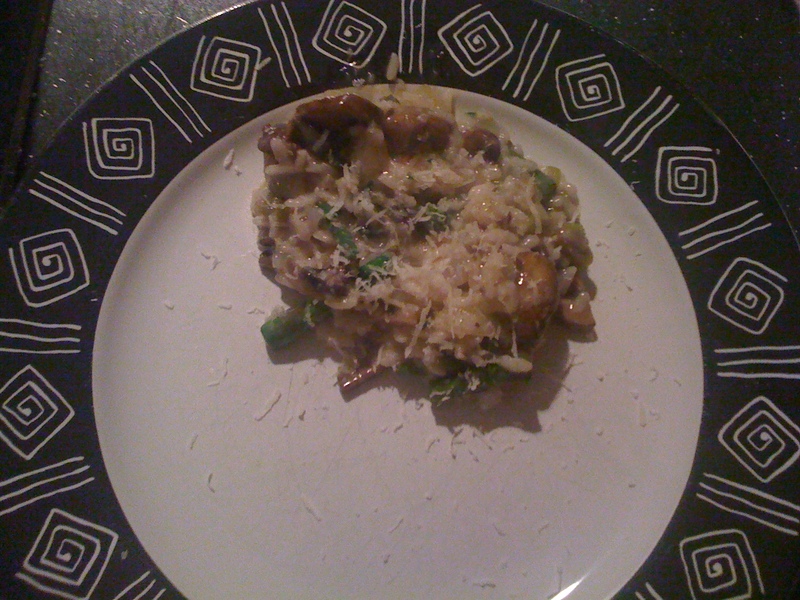 You can sub almost any veggies into this basic risotto, but i never do it without mushrooms, Oh, would you like a picture? My risotto trick: simmer the stock in a big tea pot- SO much easier to poor and no dripping across your stove. This looks delicious thanks for sharing! Love the post, Butters! Now, on to improving the photography. 😉 Keep it up! Ric- you are right about the photos! Just got a new phone witha good camera so it will hopefully improve. Thanks for reading!